RGV FC's Wilmer Cabrera tries to get the ball from Tulsa's Paris Gee during the second half of their game Saturday, July 7, 2018 at H-E-B Park in Edinburg. The Toros tied the game 1-1. EDINBURG — Given the often overlapping schedules of the Houston Dynamo and RGV FC Toros, Dynamo coach Wilmer Cabrera rarely gets to watch his son Wilmer Cabrera Jr. suit up for RGV. 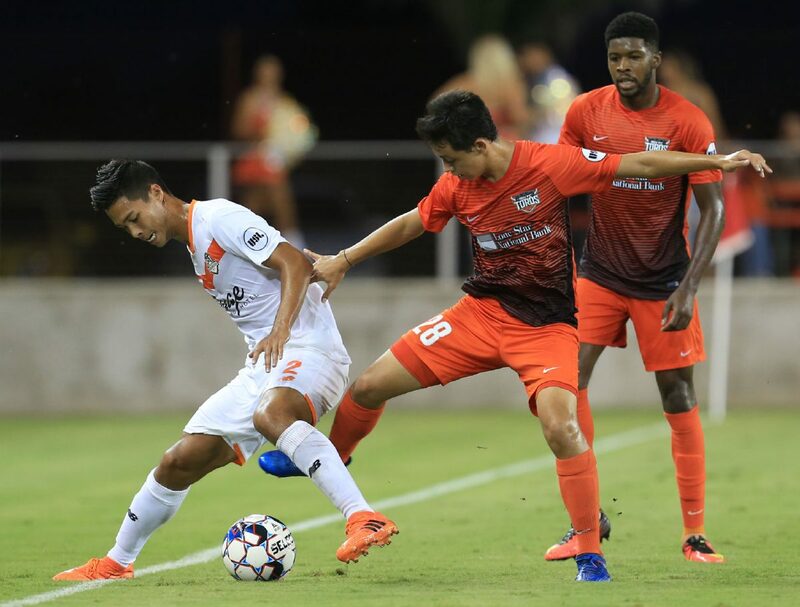 The younger Cabrera has become a mainstay in the Toros’ lineup in recent weeks, and RGV’s unusual match time at 4 p.m. Sunday against Swope Park gave the elder Cabrera the chance to take in his son’s third start and fifth appearance with the Toros. Cabrera Sr. said his son played a “very active” game, making plenty of strong touches in the 0-0 draw. Cabrera Jr. stands 5-foot-8 and 141 pounds and won’t celebrate his 18th birthday until Sunday, but his father said the forward shielded the ball and used his savvy to maintain possession. When they spoke on the phone after the game, coaching was far from the older Cabrera’s top priority. Having your father as the coach of the Toros’ MLS affiliate Houston Dynamo can bring additional eyes and expectations, both for Wilmer Jr. and his brother David Cabrera, a 23-year-old midfielder for RGV FC who is yet to see action this season. Wilmer Sr. said his sons are still learning how to manage that pressure, but both younger Cabreras said their father has been more of a benefit than a hindrance during their time with RGV FC, which hosts Colorado Springs Switchbacks FC at 7:30 p.m. Saturday at H-E-B Park in Edinburg. Wilmer Jr. first sat on the bench for the Toros during his summer break from IMG Academy in 2016, when Wilmer Sr. was the RGV FC coach. After graduating from IMG earlier this year, Wilmer Jr. began training with the Toros this summer. He’s also previously spent time in preseason training with the Houston Dynamo first team and played for the Dynamo Academy in the Generation adidas Cup. Certainly having his father coach the Dynamo helped Wilmer Jr. get his foot in the door with RGV, but that was the extent of Wilmer Sr.’s influence. RGV FC coach Gerson Echeverry said Wilmer Jr. earned his spot on the field during training by scoring goals and combining well in the final third — two aspects of the game the Toros have struggled with this season. When Echeverry discusses RGV’s players with Wilmer Sr. and the Dynamo technical staff, Wilmer Jr. is regarded the same as anyone else on the roster, he said. Both David and Wilmer Jr. said they’ve never noticed any of their Toros teammates wondering whether the Cabreras receive preferential treatment. Echeverry and Wilmer Sr. said the proof is David, who has trained with the Toros the past two summers and all of this season following four years at Division II South Dakota School of Mines and Technology. He made the team as part of a tryout that the elder Cabrera had no involvement in, and he has yet to see the field. Wilmer Jr. said David has played a valuable role in his transition to RGV FC, integrating him with the friend group David had already built. David and Wilmer Jr. live together off the pitch, and David said he’s made an effort to help Wilmer Jr.’s jump to the professional environment at every possible opportunity. Though the two younger Cabreras have accomplished their goal of playing together, both are still looking for their first opportunity to play for their father, who has never coached them at any level. Wilmer Jr. called it a dream to play for his father, even though he admits it would be “weird.” David said he knows Wilmer Sr. would be harder on either of his sons compared to his other players. Wilmer Sr. said the pressure on either Wilmer Jr. or David playing for him would be double the rest of the roster, but he’s not often thinking about the future or the possibility of coaching his sons in the MLS. Instead, the focus is on their development as players. Wilmer Jr. is still weighing his options going forward. Because he is not paid by RGV FC, he still has the opportunity to go to college — a journey he said he would likely start next fall. He said he dreams of reaching the MLS one day, but the more immediate focus is finishing out the season with RGV FC.